Pair these quesadillas with a simple salad of greens dressed with oil and vinegar for a light dinner. These delicious quesadillas are a simple and fast way to use herbs. 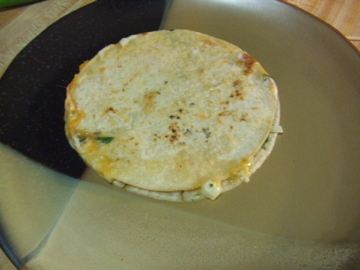 The quesadillas pictured are filled with a mixture of chopped epazote, mint, and oregano, but feel free to play around and use whatever herbs you have in the fridge! Pair them with a simple salad of greens dressed with oil and vinegar for a light dinner. 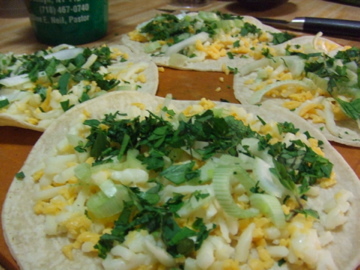 The proportions for the herbs, onions, and cheese are approximate. Feel free to adjust according to your own preferences. On a whim I decided to compress the tortillas while cooking by putting a small sauce pan on top along with a can of tomatoes, as you see in the photo. The weight helped them to cook fast and evenly. 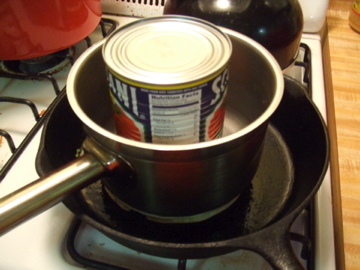 Eventually I realized the can was not needed because the sauce pan alone was heavy enough. This is reflected in the directions below. Prepare quesadillas – I like to do it assembly line style. Lay out four corn tortillas. Top each with equal amounts of cheese, then onions, then herbs. Place another corn tortilla on top of each. Heat a skillet (preferably cast iron) over medium high heat. Add oil to lightly coat the surface – you just need enough to prevent the quesadillas from sticking. If you have a well-seasoned cast iron, you won’t need much oil at all. Carefully transfer uncooked tortilla to heated skillet using a large spatula. Place sauce pan on top of quesadilla to weigh it down. Cook for 2-3 minutes until underside is lightly golden, then lift sauce pan, flip the quesadilla, and replace the sauce pan weight. Cook for a few minutes more until bottom is golden and insides are cooked through. You’ll know it’s ready when melted cheese starts to hiss as it spills over the edges of the tortilla and hits the hot skillet. Remove sauce pan weight and transfer cooked tortilla to a plate. Repeat the same process with remaining quesadillas, adding more oil to the pan if needed. Serve immediately. Suggestions: Serve topped with your favorite salsa, hot sauce, or sour cream.